Increase OperaUpClose’s social media following and get more people to attend The Magic Flute at Soho Theatre. Opera is considered an expensive and elitist activity that’s difficult to understand, but OUC’s aim is to make the artform more diverse, emotionally direct and intellectually stimulating for as many people as possible. Our main challenge was to overcome aversion based on assumptions about opera as an artform. We created a campaign based on the opera’s core themes of compassion and love, two things which everyone can understand. The idea was to allow access to discounted tickets in exchange for sharing. Anyone who followed OperaUpClose on social media and shared one thing they’d done for love using the hashtag THIS4LOVE got the code for £10 tickets. 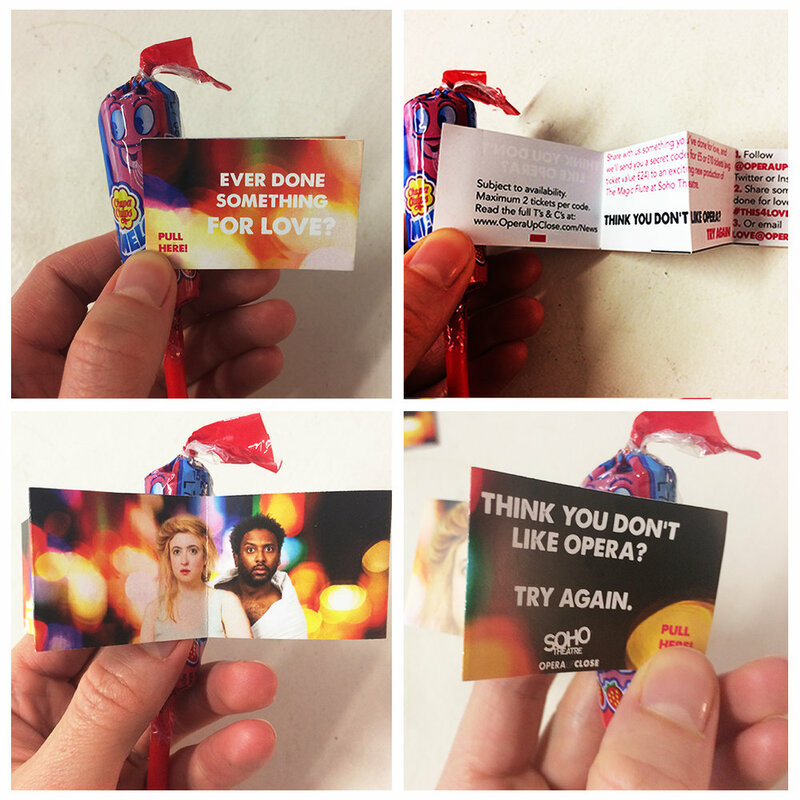 Fun factor – we made and distributed bespoke boxes of melody pops with instructions on how to participate in the campaign around London’s cafes, bookshops and theatres. Our aim was to target not just opera enthusiasts, but writers, readers, tourists, and people looking for weekend activities. Social media assets – with the participation of OperaUpClose cast we created vox pops and bright imagery to share on social media in order to encourage participation and spread hashtag use. Social media swap – with Soho-based members’ club House of St Barnabas to target a local audience interested in the arts and charity. 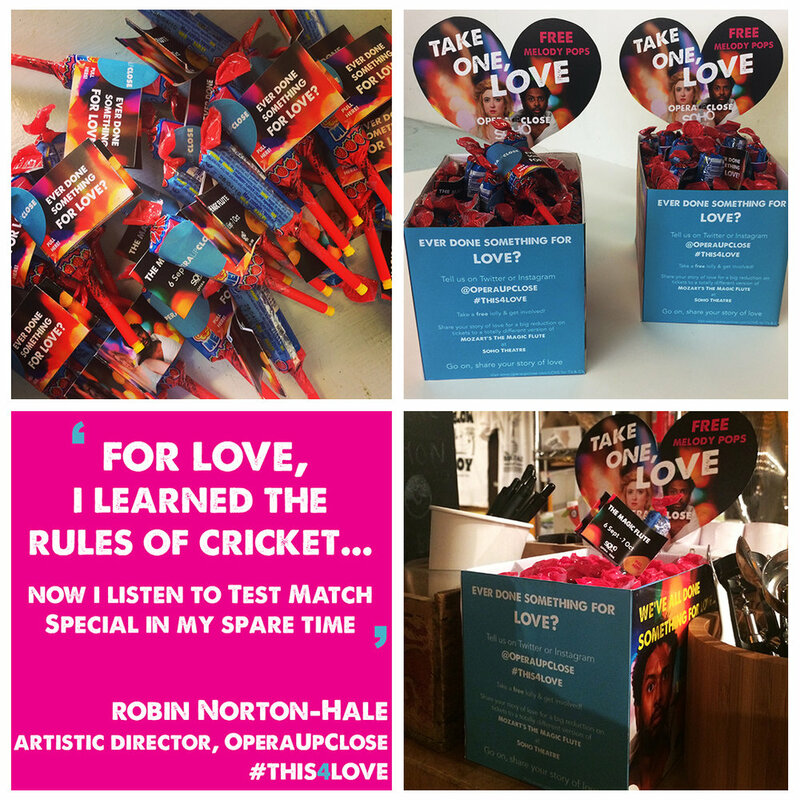 Paid social – we worked with Target Live on activity to boost uptake of the promotional offer on Twitter and Instagram.